Review: "Pleased With Lead411 Product...as well as each interaction with the company!" Lead411 was selected and is used for sales/marketing contacts and to interface with our Capsule CRM environment. We find the Lead411 platform to be VERY EASY TO USE and to contain reliable information. Our interaction with Lead411 has been excellent --- from the initial contact with their sales organization, during the VALUABLE trial period, upon contracting, and especially with Lead411's online Support Staff! Our ability to filter and triangulate our selected prospects and contacts has been most helpful. We're very pleased. We would recommend Lead411 to other small business --- however, from our experience, it appears that the platform would also function very well within larger enterprise organizations. We may have access to specific CONTACT DATA in the healthcare industry that can benefit other Lead411 users. I'm impressed with Lead411's interest in creative ways in which we may be able to share industry-specific data. Lead411 Review: "Easy to justify the spend"
We use it to identify key contacts at target accounts, update firmographic data, get latest news on target accounts, and ID technographic info. The customized news feed helps me target accounts based on real time data. Appends data for both company and lead levels with a simple upload. Can also be automated with track Star. The search filtering is like none other. I can get really specific based on technographic, firmographic, news, previous searches etc. When an email is identified through their research tool, I wish I had the option to save it so I can filter it out on my next results. The Salesforce sync had been buggy. Sometimes it will just stop working and you have to erase your cookies and cache. Sometimes the auto data aggregator stops working. It has been great for data aggregation. We are able to update fields in mass that we didn't have before. It has been great for identifying relevant news sources that our company may view as a buying signal. I would not use it to build a complete list and I would not completely depend on it for tecnografic information as we have found some of that to either be outdated or not specific enough; however that is not one of their main offerings anyway. Lead411 Review: "Lead 411 is Outstanding!" We use Lead 411 for research about CEOs and executives. Lead 411 has been our go to source for information about news, social media profiles, and key information about companies and executives in which we desire to impact. When searching for presidents of organizations they include everyone with president in the title. I would recommend Lead 411 for anyone that needs to search for companies or executives. Lead411 has a robust database. Review: "Lead411- and good investment for anyone looking to improve their business"
We use Lead411 for access to their database of contacts. We are not a mass email marketer at all, but rather we have very specific people we go after. Lead411 allows us to contact those people directly, and the up to date aspect of the contacts really helps us make contact with potential clients and candidates. They have made getting email addresses a priority for their database as well as getting the titles of those contacts. Lead411 has expanded dramatically from the time I started using them and the quality of the contacts has continued to improve. The depth of information keeps expanding as well. They are now including hiring information as well as "software used" by the contacts they have found. They do not have a way (that I know of) to select a multitude of contacts all at once. 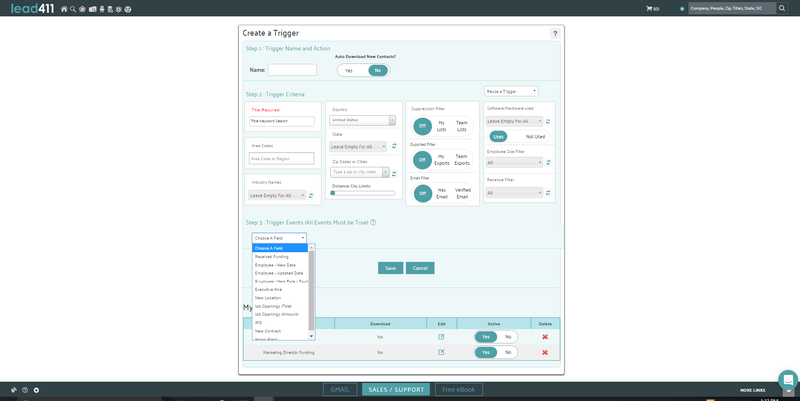 Each contact has to be selected, which is a drag if the search results are on target. I like Lead411 because I can actually have a dialog with the owner. His team takes great pride in what they are doing and are building a good business. As for Tom...He did build that! 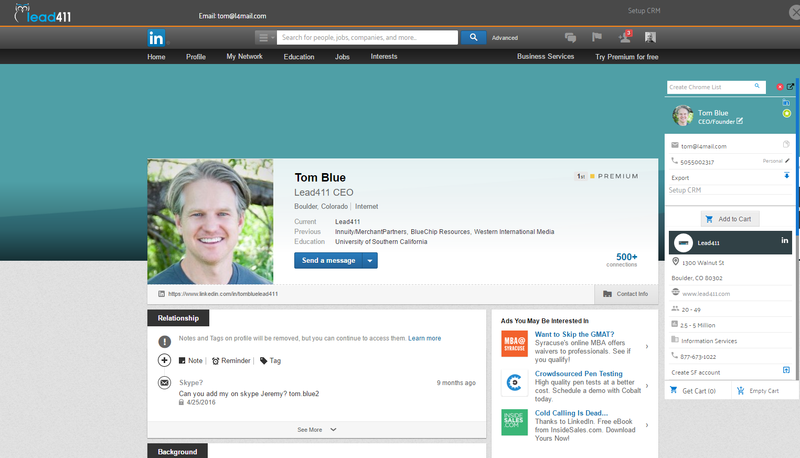 Lead411 is used to find email addresses for people we find on LinkedIn and want to market to via email. I am the only person who uses it and it is used as a backup if ZoomInfo doesnt have contact information on someone. It is a good backup and can usually find info or at least guess on their contact information based on others from that company. It is well suited for a back up data provider as opposed to the main data provider. I do like how if they cannot find an email address they still attempt to guess at one with a confidence %. They will also admit they are not the best provider for direct dials either. User Review: "Use Lead411 to get all the Leads!" Currently Lead411 is used for sales and recruiting withing our agency. It is rich in helping find those hard to locate contact details. The database holds emails, phone number and even addresses of where to contact people who you are targeting for a new sale. It is helping us build a new and thriving client base. Lead411 is well suited for sales, recruiting or anyone who is looking to build their contact network. This also shows the companies that the contact works with so would be a good resource to see where the contact you are searching is working. This is not a database for anyone who is not looking for contacts or leads. Lead411 Review: "Head of Business Development"
Our company AEs can search geographically as well as company specific for leads that are very accurate and helpful. This assists in filling the top of the funnel. Email contacts are very accurate and up to date. The Chrome App makes using Lead411 fast and efficient too. Chrome plugin works well and is easy to use with great integration. Accurate leads with current email contacts make outbound better without the email bounces most other lead gen tools create. I can search within each individual company for specific job titles by entering in whatever word (or partial word, even), to find the type of role in the company I'm looking for. I would like to have company recommendations as a choice based in previous searches. Better BI. Cleaner search functionality with better use of BI so when I search within an industry I do not get a company with no relevance to what I am looking for. Everything else works great and there isn't much else to change. Lead411 is a great tool for searching for contacts to fill the top of the funnel fast. I do not like purchasing leads and this is a great substitute and a better spend than buying lists. In my current position, I was able to create a funnel of over 1,000 new leads with an average of 200 new leads per week. Without Lead411 I would not have been able to do this. Review: "Have you heard of Lead411 for B2B Sales Leads? If Not, You'd Better." I use Lead411 on an individual subscription basis to find IT professionals and C-Level contact information and get news alerts on "sales triggers" in my market, such as mergers and acquisitions, hiring sprees, expansion and new locations, VC funding announcements, etc. It's a great tool to not only find the contact information of decision makers and influencers, but to narrow down my target market demographically using several parameters available in the search functionality. Real time news to your inbox based upon "sales triggers" determined by you, the end user. Getting most current contact info -- name, title, phone number, email -- of target audience. It's actually the most accurate in this regard of any lead generation tool I've ever ever used, and I've used many, including Hoovers, Data.com, SalesGenie, and a good many others. Ability to search the database using an extensive selection of options: Keywords, employee number, revenue, country region, state region, city/town, zip code, vertical market, job title/description and more. Ability to search contacts and companies by actual street and physical address is not there yet. This is extremely helpful when trying to strategically work a particular neighborhood where you're trying to build up your own individual name and brand recognition. It's also a way of keeping others in the sales force from stepping on the toes or duplicating efforts of another sales rep.
For anyone in sales, particularly in the direct and "hunting" category, this is a great tool. The hardest part of sales is finding the appropriate decision makers and influencers in your target market and getting them to talk to you. Lead411's contact info is as current and accurate as I've every experienced in my decade + in sales, and coupled with their customizable news alerts, it allows you to contact prospects at the right time with something relevant to talk about around their company and industry, increasing your chances of a successful sales call while allowing you to filter out those prospects that just aren't a fit for what you do. A quick "no" is the second best thing behind a "yes" because you get back so much more of a very valuable asset -- your time. This tool helps you to dramatically reduce wasted hours hunting for the wrong contact person and the wrong fit for your services. Efficiency and time management improved dramatically by using Lead411. User Review: "Good lead-gen service, Lead411"
Lead411 is a prospect generation program for us. It saves time having good data in one spot versus searching different sites trying to find the info we need. Their daily email is also useful for helping us spot companies that have some sort of news or activity. Lead411 is well suited for sales. Once contact has been made, my company employs another service to get more detailed information, but for an initial contact this service works well. Lead411 Review: "Lead Generation Made Easy- Lead 411"
We see our Lead411 partnership as a must have for our prospecting needs. Our marketing/sales team relies heavily on our subscription for lead generation. Additionally, we have always received excellent customer service whenever we needed it. Fast and helpful. We are a huge fan of this service and software. The quality of the leads and the updated employee information is extremely important. We have found both to be very accurate. Review: "Ease of use makes Lead411 an integral part of our lead generation process"
As a business to business lead generation firm, it is critical we find the right decision makers at key companies for our clients. Lead411 is one of the sources we use for research and development of lists for our campaigns. Lead411 is used across the organization to build campaign lists and confirm contact information for companies we are targeting on behalf of our clients. The ease of being able to quickly look up a company and/or contact to get information quickly. Ability to build a list easily based on key criteria. Provides emails with contact record. Ability to upload more than one company or a list of companies to match and then build a list. This is something discussed with Lead411 and from our understanding is under development. The ease of use makes Lead411 stand out. We can quickly look up individual companies or contacts for information or build lists quickly based on needed criteria. When we have a question, they are quick to answer and recently did a training session for our team as well. I would recommend Lead411 for anyone looking to build their sales pipeline by adding additional contacts and companies to target. Review: "Lead411 - nothing comes close at the price..."
We are a specialized management consulting firm... we don't cast a wide net, rather a very focused search for the 'right' contacts. Lead411 is able to deliver contact info for not only contacts in L411, but serves as our go-to source to find contact info on executives sourced/identified in LinkedIn, or prospective clients' websites. Most research facilities focus on IT/Tech and Procurement. L411 offers senior business-side executive contact details. It is an economic value... not real pricy for what it offers. Large database of contact details for execs sourced within Lead411, or sites that identify qualified names - but don't provide contact details. Continue to build the non-IT contact database of contact details - adding companies and executives across those organizations. Lead411 is a resource for in-the-trench and outbound/inside sales folks who need quick access to contact details. Also, with its nice press-release daily push, its appropriate for execs across your organization who want an concise recap of M&A, new execs, and fundings for industries and companies of interest. Lead411: "Honest User Review From A Client in The Data Business"
Lead411 is currently used by our sales department and it's been key to helping them close more deals. They use the news feature and the contact data to figure out who to reach out to, when to reach out, and why. Small businesses looking for a great data offering to start getting their email marketing program going. Companies also running Salesforce.com will get more use of their integration. Lead411 is an excellent tool to get background information on companies and find contact information for the management team. I've used the platform for several years and expect to use the service for years to come. The name and contact information for c-level management. Search by business sector and geographical region. Lead411 could be improved by having more consistent contact info for management. Lead411 is well suited for getting a quick snapshot of a company. Review: "Check out Lead411, a valuable tool for finding new sales prospects." I use Lead411 as a key sales prospecting tool to develop my territory. My company tracks sales leads & opportunities, but I have the responsibility to find new prospects. I was spending way too much time searching for new companies to call on. Then I began to look for a product to help with lead generation. Lead411 offered a free trial & was exactly what I was looking for! Lead411 is such a valuable tool for any sales professional! Lead411 provides a "Search Filter" that helps me easily identify a list of companies in a given geographic area. I can easily search for companies by revenue size, #employees, industry, SIC codes, etc. For each company listed, I can review their website, news articles & a see a list of current contacts. I can "Save" a search based on key parameters & use ongoing. Also, I can set up a list of companies I'd like to see news about each day. Lead411 saves time & provides intelligence needed to identify prospects. Lead411 is easy to learn & use. 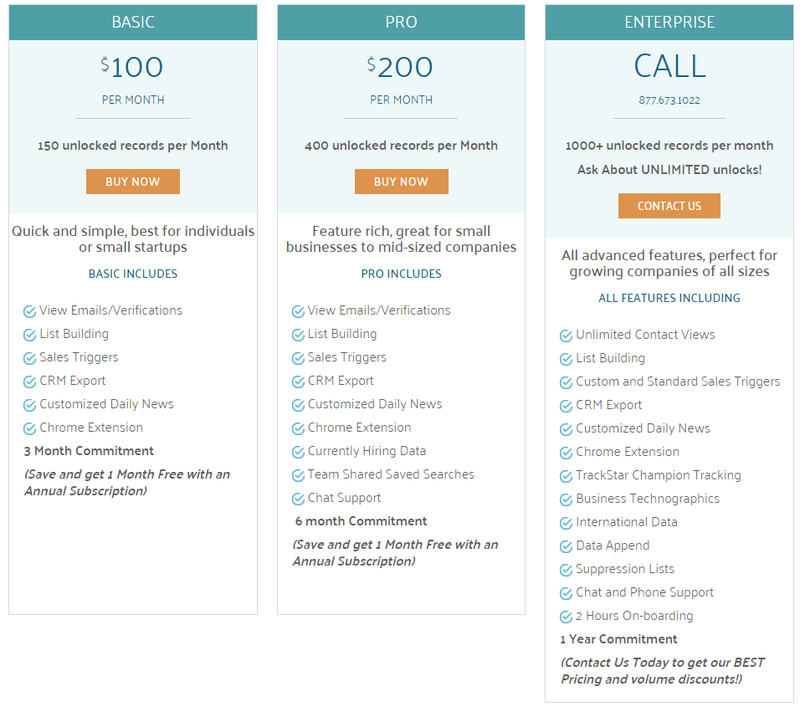 Any additional feature I'd like is already available in one of the other pricing plans. Lead411 is the perfect tool for sales professionals that need help identifying prospects. Lead411 Review: "Independent Full-Desk Recruiter - A Tool I Can Buy on my Own ;)"
I use Lead411 to contact potential leads about working with me to help fill internal openings within the software engineering sector. We do not have a company-wide lead tool. Every recruiter is responsible for their own lead development efforts - so I subscribe to Lead411 on my own dime :) It sets itself apart from other tools like ZoomInfo where you only get contact info, and it's not always as accurate as Lead411. Also, I can see who is hiring, who just got funding, etc. You can't do that with DataFox, RainKing or DiscoverOrg with a self-bought membership. They all push for team-based pricing. Thanks Lead411! - Sincerely, Full-Desk Recruiter (who pays for their own biz dev tools!). Company/People Intel - who's hiring, who received funding, mergers, new hires. Contacts added and updated daily! I CAN BUY AN INDIVIDUAL MEMBERSHIP, because unlike other companies, we don't have lead tools paid for by the company! A co-worker signed up and someone asked him for his payment info via email. This was strange. My manager bought a few seats for my team and the "Customer Success Manager" gave him a hard time about pricing and number of seats. I thought this was pretty tough considering the fact that a couple of us referred him and he bought the seats because we rave about it. I've noticed a few folks who have moved on to another company. Is there a button that top users can press to add updated information or flag it as a bad contact? The industries and job titles should be more vague. C-level/VP/Director + Department = CTO/VP Engineering; similar to how ZoomInfo has it. A lot of the titles that Lead411 has are tough to search on. I don't like having to keep scrolling down for more people/companies to come up on the list. One time I had no idea that I had more to load! There should be something that tells you to keep scrolling, or just load it all at once! Lead411 is well suited to the agency recruiter or business development representative. It is also well suited to B2B companies. Lead411 Review: "Effective Targeting For Prospects"
We are using Lead411 to gather information on companies and to gain emails. While some of the emails bounce back, a good deal of them have worked. Lead collection. Prospecting. Great for finding the emails and phone numbers for contacts for companies. User Review: "Lead411 for new business development"
Several people in the organization use Lead411 to generate new leads. I search on certain types of companies (technology - software, hardware, etc.) and look for new hires (VP Sales, CFOs, etc. ), recent funding, mergers and acquisitions and IPOs. I then send introductory emails to the executives congratulating them and include a message that I think they would be interested in. Lead411 is great for new business development, perhaps not as good for account management. Lead411 offers a B2B Lead Intelligence software platform that provides corporate and contact context to sales and marketing teams in order to increase their lead identification and conversion rates. Lead411’s verified list development technology can provide your marketing programs with high quality target lists that are more accurate and reliable than those acquired by traditional methods. According to the vendor, with Lead411 customers get accurate contact information and a well-rounded view of their prospect’s business so they can identify the best opportunity to pitch and close deals.